Keep your green fingers protected with this essential, hard-wearing piece of horticultural kit.Whether it’s providing a barrier from the muck and detritus, or to keep your fingers mobile on a cold spring morning, a pair of good, durable gardening gloves is a must for your garden and shed.Gardening gloves suitable for all garden tasks from weeding and potting to pruning the roses. Our range of colourful and hard wearing gloves have been selected to give the best protection to your hands whilst working outside whatever the task or weather.Our large range of gardening gloves is available to buy online. 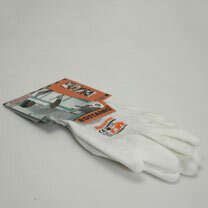 We have various colours and sizes to suit your needs, all comfortable and very durable for the garden and shed through out the year.Protect your hands while in your garden and shed with high our quality gardening gloves. 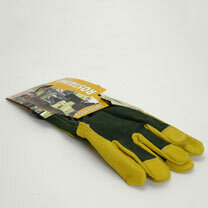 From flowery to more the classic glove, our range of gardening gloves will become your best friend’s on your hands. Mixed native hedging bundles are made up of a selection of six species that are ideal for wildlife. Being relatively prickly and with a long flowering period that the bees will love, these native mix bundles include species with haws, hips, nuts and sloes making a species-rich hedge that will attract a diverse range of wildlife. It’s not just the birds and the bees that will benefit from this wildlife friendly hedge, the attractive haws and pretty flowers along with varying foliage textures makes this a nice-looking hedge with interest throughout most of the year. Flowers March-November. Grows 20-40cm per year. Supplied as 120-150cm bare roots.Bare Root hedging plants are a great, cost-effective way for you to achieve your hedging goals. They are grown in an open environment, exposed to natural conditions, which allows these plants to develop with no restrictions. When opting for this root type, you will receive well established plants with sturdy root systems as a result of their growing method. Given the way in which they are grown, bare rooted plants are available from November until May as this is the time of year when the plants are dormant and can be safely lifted from the field. 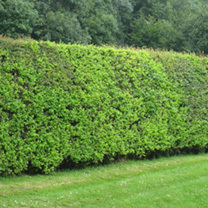 This category mostly consists of native, deciduous hedging species which many of them flower and/or berry so they make great hedges for wildlife and provide seasonal interest. 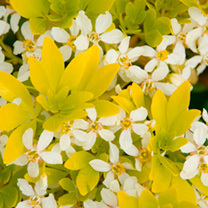 Choisya ternata ‘Lich’ (Choisya ternata Sundance, Mexican orange Sundance) is an evergreen shrub with glossy bright yellow leaves with clusters of fragrant white flowers, guaranteed to brighten up any corner. It makes a fantastic background for purple and an ideal front of border planting. It does not flower as well as the species, but the bright foliage more than makes up for this. Like all Choisya, it is easy to grow, and though it prefers a sunny spot, it will cope with a little shade. Flowers June-July. Height 2.5m (8′); spread 2.5m (8′). Supplied in a 3 litre pot. Enjoy the shades and scents of Chelsea in your garden this summer, with this beautiful collection inspired by RHS Chelsea Flower Show.A selection of perennial varieties (3 of each) bringing colour and height to borders and containers, not only this year but next as well. Plants supplied in 9cm pots. 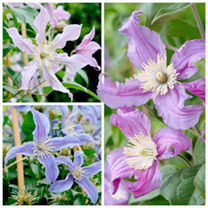 As seen in the Garden Press!Clematis Amazing varieties Rome, Oslo and London are part of a brand-new range of long-stemmed Clematis ideal for cutting and bringing indoors. Specifically bred and developed to produce long, straight, sturdy stems with an excellent vase life, these beautiful blooms not only look great in the garden but also as a cut flower in the house. Flowers are produced in early summer with a second flush later in the season making them magnificient cut-and-come-again varieties. Five or six flowers will often be developed on each 40-50cm long flowering stem allowing the display to last longer whether inside or out. Grows to height of 1.5-2m. Supplied in a 7cm pot, plant size 15-25cm.Rome – Produces large light purple flowers with clear white stamens in the centre in early summer that continue over a long flowering period,Oslo – Deep blue flowers are produced that ripple and curl slightly towards the tip and carry a centre of clear white sepals. This variety was part of a bouquet presented to the Queen at the 2016 Chelsea Flower Show.London – Produces large, pale blue flowers over a long period. An eye-catching decoration for your garden! 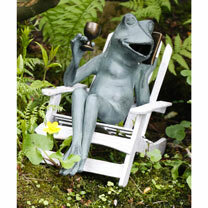 This frog has made herself quite comfortable in her garden chair, enjoying a glass of wine whilst chatting on her mobile.Made of high-quality aluminium. Height 29cm, depth 38cm, width 21cm. 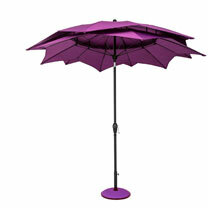 Our super stylish parasols have weatherproof polyester canopies that span 2.7m (9′) & come in a choice of 5 colours. The parasol poles are made from aluminium with an anthracite coating but the canopy frames are made from fibreglass, giving them more flexibility & making them less likely to break or bend. The parasols can be easily opened or closed using the crank handle & have a push button tilt mechanism to angle the canopy into the sun. PLEASE NOTE: Base is not included.Lotus – Reminiscent of a flower in bloom, these unusual parasols are quite unlike any we have seen before! Colour: Purple. 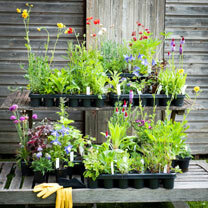 Turn your borders into a carpet of colour, with 9 potted perennial plants for 27. 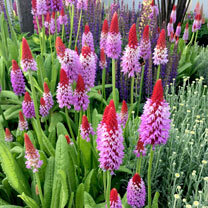 Our gardeners have picked out a vibrant selection of perennials that combine to create instant wow factor in time for summer.The collection includes the Armeria in three different colours, 3 of the of the Scabiosa Blue Note with its cheerful shades of blue, and well give you 3 of the striking Vialii Red Hot Poker free with your order.One of those plants thatll catch your eye every time you step out into your garden, this bold, two-toned Primula Vialii has unique pyramid-shaped flower heads that burn brightly with colour throughout the summer.A fuss-free way to transform your borders with colours that work together beautifully, this collection includes 9 of our most popular perennials for just 27. High potash feed to promote bumper crops. 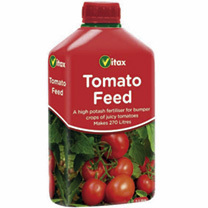 Use on tomatoes grown indoors or outdoors. Apply to individual plants following pack instructions from spring right through the growing season for healthy crops of juicy tomatoes. 1 litre.